What do you think of the results from the Channel 5 poll? We munch six billion potato treats every single year. According to a poll of the British public, Pringles are the best crisps around. Thousands of members of the British public were asked for their favourite crisps as part of a TV show with Pringles beating Doritos to the top prize. 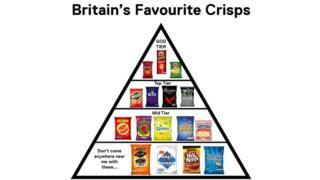 But some viewers of the show took to social media to express their dismay at some of their favourite crisps being at the bottom of the list or not even mentioned. The programme 'Britain's Favourite Crisps' - on Channel 5 - dedicated two hours to the hotly contested debate. Are they right? Let us know in our poll below. Crisps are my favourite food although my Mum said Crisps are not a food. I love Smoky bacon and prawn cocktail. Doritos are amazing too. I gave up crisps for Lent.